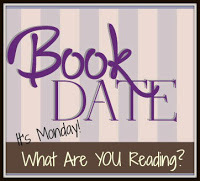 Book By Book: It's Monday 10/22! What Are You Reading? I had a pretty good week - busy, as always, but I also had two full days at home for writing, so I got some things done. I didn't feel well on Saturday - my chronic illness was flared up. But then I realized it was Dewey's Readathon weekend, so I listened to my body, settled in on the couch, and enjoyed extra reading, which is a real treat for me that usually only happens when we are on vacation. I finished a review book for Shelf Awareness, The Adults by Caroline Hulse, a debut novel due out in late November. It's a funny farce about two parents who go on a Christmas vacation with their daughter - and both of their new partners (and their daughter's invisible friend who has some very firm opinions about everything). What could go wrong? It was filled with drama, unexpected twists, and plenty of humor, with warmth underneath the laughs. I enjoyed it. Now, I am reading a book I really didn't want to read at first: America's First Daughter by Stephanie Dray and Laura Kamoie. My book group chose it (I missed that meeting), and I wasn't too excited about a 600-page novel about Jefferson's daughter, especially in the middle of the annual RIP Challenge, when I have SO been enjoying reading fast-paced thrillers, mysteries, and ghost stories. BUT...it's actually really good! My need to rest this weekend meant that I read about 200 pages Saturday (a lot for me), so I am now past the midway point, and I have to admit that it's fascinating. I'm driving my husband crazy interrupting his own reading to say, "Did you know...?" over and over. The history is interesting, the story is compelling, and the characters feel real. Kamoie is actually a history professor, and much of the novel is based on Jefferson's actual letters. There's no way I will finish it in time for book group Wednesday, but I think I will finish it (I wasn't planning on reading the whole thing when I started!). I finally finished making my way - slowly - through the print version of Macbeth by Shakespeare. As with all of his tragedies, pretty much everyone dies, and there are a LOT of stabbings. But, at least now, I understand the storyline, so I plan to go back and finish the audio production. In the meantime, I am thoroughly enjoying listening to The Lost Ones by Sheena Kamal. It's the first book in a new thriller series starring Nora Watts, a woman who was brought up in foster care and now lives a solitary life and looks for missing people. This case is different, though, because the missing teenager is the daughter Nora gave up for adoption 15 years ago. It's set in Vancouver and has plenty of action, adventure, and suspense, but the main character and her history are also fascinating and compelling. My husband, Ken, finished Still Life by Louise Penny, book 1 in her classic mystery series of Chief Inspector Gamache novels, which I just read last month. He enjoyed it, and the ending took him by surprise - which is hard to do for him! Now, Ken is moving onto one of his birthday gifts from me, The Outsider by Stephen King. It's a suspenseful thriller that he's been looking forward to. We only wish we could share it with my dad, who was a huge King fan. Our son, Jamie, 24, is still reading book 3 in the Stormlight Archive by Brandon Sanderson, Oathbringer, a big brick of a book at 1250 pages. He says he didn't have much reading time this week! Every time I think of Shakespeare, I'm transported back to high school English class. For some reason, Shakespeare's works always came alive in English class as we read it aloud and immediately discussed each section. Outside of that group, I wonder if I would enjoy it all on my own. I have yet to read a Stephen King novel. I'm sure my hubby is disappointed (he especially likes King's books on writing). LOL One day... And 1250-paged book?! :-O Have a great week, Sue! I agree, Shaye - I enjoyed Shakespeare more in class. I struggled with Macbeth. Perhaps I would enjoy the comedies better - all the evil & killing got to me! Though I saw my first-ever Shakespeare live performance last year - Romeo & Juliet at a local theater - and really enjoyed it. OMG - you MUST read Stephen King - forget his popularity - he is just simply an outstanding writer and can pull you into a story and write realistic characters better than anyone else. People think he only writes horror, but he actually writes quite a variety. On Writing is excellent, even if you aren't a writer. One of my favorite novels of his is actually historical fiction - 11/22/63. Try it! It will blow you away. Put it on your list for Big Book Summer next year :) Or start with his short stories - they are easily digestible and much shorter! America's First Daughter does sound good, even though you were dragged to it!! A sizeable read. Hope the rest though did you good. Thanks, Kathryn - the rest DID do me good, and a good book helped me stick with it and not jump up to "get things done". I loved The Outsider by Stephen King and hope your husband enjoys it too. I think yours was one of the reviews I read that convinced me to get it for him for his birthday! I liked the Outside by King as well. I am currently reading Little Boy Lost by JD Trafford, which is really good so far. Glad to hear it, Helen! This is a first. I haven't read any of the books on your lists for the while family. I am the person who selects the library kits of books for my book club and I do not pick a book if it is over 500 pages. I can't imagine what would happen if I selected a book over 600 pages. Gulp. Too long! Glad you are enjoying it.